Blue-fronted Amazon parrots are hardy birds, but they require a balanced diet in captivity nonetheless. 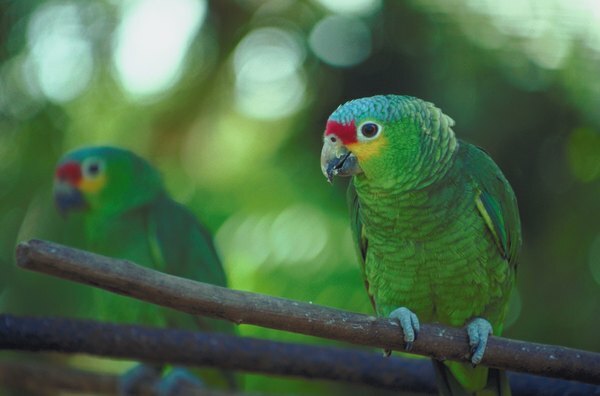 Blue-fronted Amazon parrots are among the best talkers -- and singers -- in the avian world. Their vocabulary and range, coupled with their intelligence and stunning plumage, make them popular pets. Amazons have delicate systems that are easily upset by bad diet. A proper diet promotes health and longevity. In the wild, blue-fronted Amazon diet consists of seeds, nuts, fruits and plant material. For pet Amazons, organic pellets and mixes are the best bet, as are all-natural mixes that include dried fruits, veggies, herbs, greens and even superfoods like bee pollen. Fortified commercial parrot foods often contain fillers and artificial colorings that at best add no nutrition and at worst may be harmful. A rule of thumb is to avoid labels on which ingredients sound more like chemicals than food names. An ideal Amazon diet is 80 percent organic pellets and 20 percent fresh fruits and veggies. Amazons should eat a variety of fresh fruits such as apples and grapes, and garden vegetables such as spinach, watercress, lettuce, dandelions, carrots, corn on the cob, peas, endives and sweet potatoes. Dried fruits and vegetables are good alternatives to fresh. Serve them crunchy or toss them in water to rehydrate as a tasty soup. Just beware of dried produce that contains the preservative sulfur dioxide. It is known to increase hyperactivity, aggressiveness and feather shredding in Amazons. Though pellets are formulated for the optimum nutrition balance, Amazons occasionally need supplements to help them through various stages of life. Egg-laying, for example, requires a calcium supplement. Mixing powdered supplements with water into moist food is generally considered better than sprinkling dry powders onto pellets, seeds or nuts. The powder will simply end up on the bottom of the food dish. Also, don't forget that a healthy supply of fresh water is an essential part of Amazons' diets. Consult your veterinarian to determine whether your Amazon needs a supplement. Amazons, like most pet birds, love seeds and nuts, which are fatty foods that can easily upset their digestive systems. Diets too heavy in seeds and nuts can cause liver damage and cancer in Amazons and will likely kill them. Nuts and seeds for Amazons should be viewed as junk food, the avian equivalent of cookies and cakes for people. Use seeds and nuts only as training treats. Never give birds human snacks containing chocolate or caffeine. Do Cats Need Meat to Have a Good Diet?